Children have tremendous respect for drawing. They are in awe of anyone who draws a picture for them–anytime, anyplace. For example, they’ll pay close attention when cartoons are sketched on a place mat at a restaurant. Children are equally impressed with simple drawings as they are with renderings of an accomplished artist. But do children gain the same respect paid for drawings they make? When a child hands you a drawing, they are sharing important information with you. They may be excited with their accomplishment of scribbling of a few lines and shapes. Or, with what appear to be random scribbles, they may be expressing an important event taking place in their mind—real or imagined. Sharing drawings is an excellent way to open a vital channel of communication. Spend a few minutes to read the drawing being presented. Ask them to tell you about what’s going on in their masterpiece. 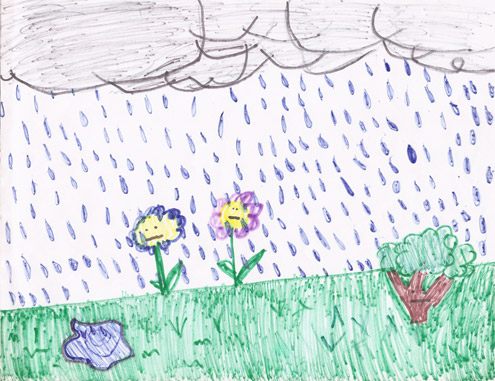 The young artist has taken time to share a snapshot from the inner workings of their mind. If you accept it with genuine interest, you’ll be sharing ideas and information at the deepest levels of trust. You’ll learn about the importance of drawing as you help children to improve their artwork. You may even rediscover your own childhood thrill of drawing. Note: Featured drawing is from a cherished book that my grand daughter made for me ten years ago. Join me in our Draw With Your Kids studio sessions. Founder and drawing coach at the Scribbles Institute, Rob helps adults and kids learn basic drawing skills for work, school, and enjoyment. He is the author of a number of how-to-draw books.